Produces hot water in direct sunlight and under diffused radiation conditions. Produces hot water even in inclement weather. Needs a collector ratio of 1sq.ft to 2.4. gallons. 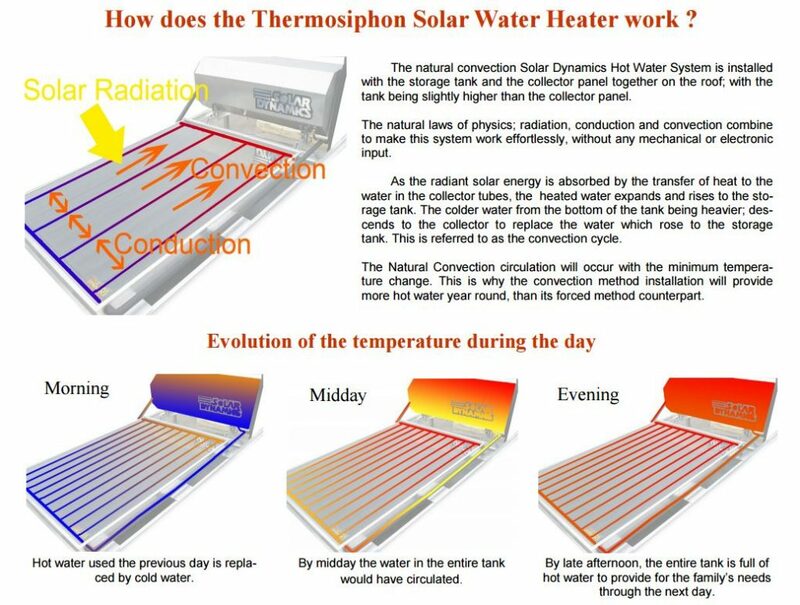 The Solar Dynamics “natural convection” flat plate hot water system works effortlessly, by using the three basic laws of physics. Radiation, conduction and convection work together in unison to provide all the hot water you need for daily use. Incoming radiant energy enters the collector through the safety tempered glass cover. (Safety tempered glass is one of the innovations pioneered by Solar Dynamics). By “conduction”, the absorbed heat of the copper plate is transferred seamlessly to the water in the copper tubes through “fusion bonding” technology. (Fusion bonding technology is the most rapid heat transfer method, and eliminates solder). The heated water rises by convective energy to the storage tank; while colder, heavier water from the bottom of the storage tank descends to the collector for heating. The storage tank is located slightly above the solar collector panel. The Solar Dynamics natural hot water system operates totally free of electricity for its circulation. Even a slight difference in temperature of the water in the collector panel is enough to effect the system’s circulation. This is why the natural convection system heats more water year round, than the mechanically forced “split” or pumped method. There is an internal electrical heating element controlled by a thermostat, which in the event of inadequate hot water, may be activated by a switch. This is very seldom found to be necessary. We estimate that usage of the booster will be around 5 times per year for 1 hour; during prolonged inclement weather, or in cases where there are extra house guests. The Solar Dynamics natural convection system is the Caribbean’s most efficient flat plate solar hot water system, in the absorption of heat at 863.5 Btu per sq.ft as tested and rated by Florida Solar Energy Centre. Its heat retention is also the highest at 3.2 Btu per hour. The Solar Dynamics Hot Water system is your hottest choice. It’s known to be the hottest, with the longest service life. The typical family saves 4,000 kWh of energy per year with a Solar Dynamics 80 Gallon Hot Water System; generating a typical return on your investment of more than 50%.